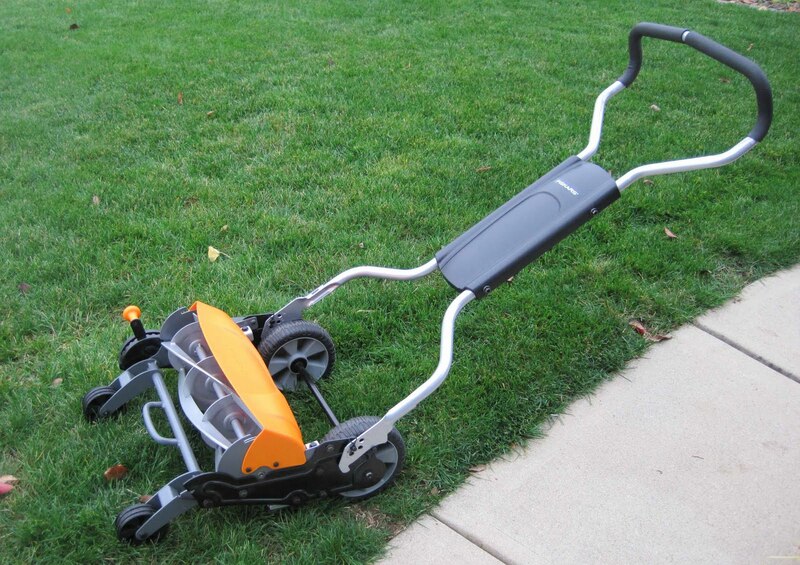 Since attending the Garden Writers Association Symposium in late September, I've wanted to get a new Fiskars® Momentum™ Reel Mower to try out on my own lawn. 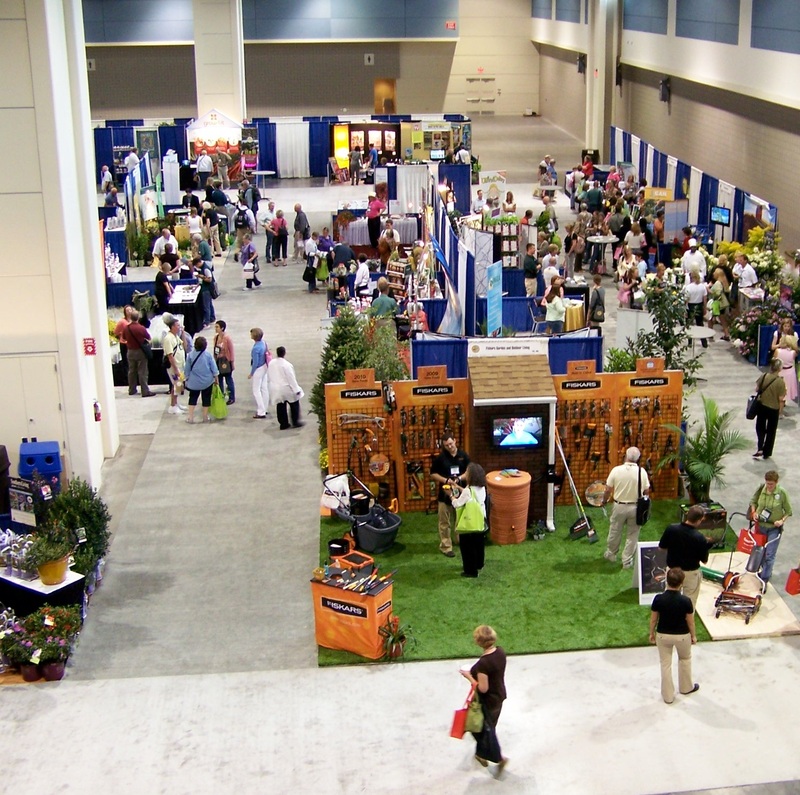 I first saw this mower from above as I entered the trade show. There it is, in the lower right hand corner of the picture. And guess who is standing there looking at it? Yes, me. 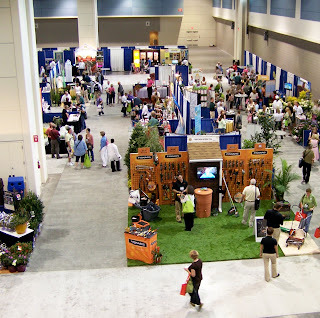 I sent out a note to a few people I knew who had attended the symposium and asked them if they had a picture showing the trade show from above and someone sent me this one. Imagine my surprise when I looked more closely and saw that I was in the picture. I should note that I did not spend my entire time at the trade show admiring this new mower. Just part of the time. But I will admit that I did ask if I could get one to review. I told them how I tweet via Twitter when I mow. I showed them my avatar on my iPhone, the one of the lady in the white dress mowing with a reel mower. And others vouched for my character and confirmed my reputation as a gardener who mows her lawn and enjoys doing it. Finally after a few emails back and forth, it arrived on my doorstep on Wednesday, Nov. 25th. It's like Christmas, one month early. So while most everyone else spent Thanksgiving morning cooking, I spent it putting this new mower together. But I didn't spend quite all morning putting it together. To say that would be a bit of an exaggeration. It only took about 15 minutes and one wrench to put the handle together with four bolts and then attach the handle to the mower part with two cotter pins. And I didn't even have instructions since this one is a demo unit. It is obvious how to put it together and easy to do, too, with just one person and one wrench. The mower has arrived just in time because the mowing season is sadly coming to an end here in central Indiana. I will mow tomorrow, likely the last time I mow this season, when it is supposed to be sunny and 55 F.
And I will mow with the Fiskars® Momentum™ Reel Mower. I don't know of anyone who has wanted a garden tool so badly or one who mows so often. The two of you are gonna bond in style. It looks lightweight and easy to use. Not like the one I used back in the 50's on my grandma's lawn. Congrats to you! If I was looking for a mower I would get one like this. I like the fact it is quiet and uses no fossil fuels. I don't have a traditional lawn I have a clover lawn. I Whack it back once a year in mid-late Summer. I use a noisy, fossil fuel burning weed whacker. If this mower could be raised high enough to mow my clover at a height of at least 6 inches I might consider buying it. Although I've had the noisy weed whacker for for over 15 years and it still works. Maybe when it breaks irrevocably I could replace it with this. That's a beaut! Does it come with a blade sharpener? Can't wait for the review. It looks very cool! I have an old reel mower that is past its shelf life. If this one performs as good as it looks, I might have to get one. Good for you, Carol - you sound like the perfect person to test the Fiskars Reel mower! That is a handsome mower, Carol. I'll admit, the first thing I thought when I read you were in the overview photo is "Huh, probably not a surprise!" Hah! Carol, it doesn't surprise me to see you in that picture! You visited that mower more than once and I think you lingered a little longer with it each time. I'll look forward to hearing about its maiden voyage! While you were unpacking your brightly colored reel mower, I was buying one in a thrift shop - well, mine isn't exactly bright. I was so excited to find it and have given it a spin around. I'm sure mine doesn't perform at all as well as your handsome looking fiskar, but I'm excited about it anyway. Mowing without the noise and exhaust - the way it should be! Carol, Looks very ergonomic. Enjoy your new Mow-mentum. You deserve it. I had fun looking through that photo for other people I know as well. As for the mower, Dee said it best. I'll be anxious to hear your results. I too love to mow and do so 2x a week in the spring and fall and usually 1x a week in the summer. Indy is flat, we are kinda hilly. Our hill is what has stopped me from looking into it. When you are mowing, can you imagine if you were going up hills? Neat! I'd love to hear how well it works. Especially for trimming aorunf shrubs, sidewalks and border areas. wow, it sure is a beauty!! THis is what I'd want to know - how quickly do the blades get dull? Shoud you sharpen and properly care for the blades with each and every use? WILL you sharpen and properly care for the blades with each and every use? Enjoy!! It sure is a cute little thing. I hope it works on your garden as you expect it to. I think it is just meant to be since you have a picture of yourself admiring the thing before it even gets to your garden. It must have been love at first sight. We need before and after photos of your lawn. Waiting your review! It is fate, Carol. And how appropo that you'd be standing there in your lovely signature green shirt, too. When I first glanced at the right corner, I knew you were the one in green! Happy mowing today - we have frost this morning and 29 -- so I suspect you might be mowing a little later on! Carol I know that was exciting to receive. I love Fiskars garden tools did not know they had a lawn mower congrats! So glad you got one! Do you know when it will be in stores? Keep us posted on your progress! Another important factor is that the Fiskars Momentum reel mower is much quieter than other reel mowers. Everyone assumes that reel mowers are quiet, but many are loud as the blades come together. The Fiskars VersaCut design keeps the noise to a minimum.